SHENZHEN, China, May 28, 2018 /PRNewswire/ — Growing from a fishing village in the ’70s to a metropolis now, Shenzhen has seen rapid development accompanied by imbalance and non-systematic resource allocation. To improve city administration and service capabilities, Shenzhen has been working hard to transform it to a “smart city”. 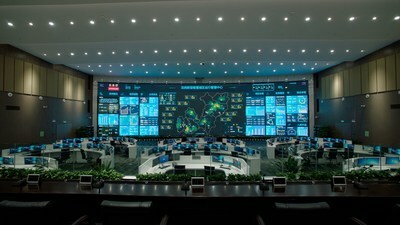 Committed to Shenzhen’s mission of becoming a Smart City role model, Longgang district built the “smart city brain”, Longgang Operation Centre (LOC), and introduced the world’s largest NPP LED display system provided by the world-leading LED manufacturer Absen. Composed of 798 panels with an elegant curve of 37.1 meters in radius, this 166.9 sqm 1.2mm screen is 25.6m by 6.5m and contains a record-breaking 103 million pixels. Featuring industry-leading technologies like power and data redundancy, CrystalView and PreciseAlign technology, this control room solution can offer quality images, comfortable viewing experience and robust stability. 181 signals are received and displayed through 105 windows at 720p (40 at 1080p and 10 at 4K resolution). What highlights this project is the innovative power and data redundancy technology, which secures the robust stability of the “smart city brain”. Each panel is equipped with two power banks and two receiving cards so that the power and signal can be switched to the backup set whenever needed, which means the display system will never go down. “We once were in a dilemma of choosing LCD, DLP or LED. LCD and DLP screen would show unacceptable gaps for a demanding control room environment,” said project manager Wu Yanbin, “but we know it is right when we try CR1.2 and see each panel fits seamlessly to the next, leaving no black bezel, not to mention the power and signal backup design. That’s why we choose Absen”. Absen is an award-winning brand providing LED display solutions and service and has been ranking first among Chinese manufacturers for nine years in a row in exporting LED displays. Their LED displays have been exported to over 120 countries and regions.